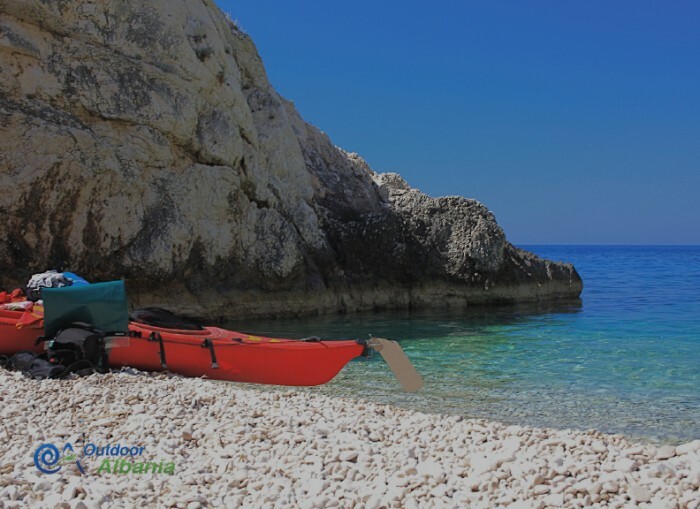 For several years sailing the Karaburun peninsula with the kayak, was in the personal list of things "to do". My father had tried to leave only two times, but could not go very far because once approached to Gjuza Cape the troubled sea and wind forced him to abandon the enterprise. After over two hours of tedious aggressive dig, I fortunately benefited a surprise "walk" to Pashaliman, that was generously offered by a Navy patrol military, whose Effective was exploding mines, exactly on the beach where I predicted the landing, near the bay of St. Jan. The same thing happened to me during the first attempt - when a sudden wind changed in less than half an hour the calm sea by merely hardly be navigable waters. Slow waves and strong wind sailing to prevent whenever raises to rowing oar, by the changing direction. Steep rocky shores that continue for miles on the west side of the peninsula, limit the possibility for release on shore in case of danger. There are only a few small beaches where you can reach without hitting the rocks and they are quite far from each other, in case of strong wind, currents can carry more rapidly offshore. Adventure in this tough environment had to be prepared so carefully indeed, and not simply as an ordinary walk on the beach. Moreover, this area is not covered by the mobile service. There was needed a combination of two or three free days with favorable weather conditions - which became available during the full moon of August 2010 as I was in Vuno for a few days off. It was predicted time of calm with little wind from the north, and the kajak was ready! Unfortunately none of my friends of the adventures was not free these days, so I decided to try "alone". On the laptop, carefully monitoring weather developments of those days, while in "Google Earth" and the map, points out the required stations and intermediate stages. I predicted that the trip would last two days so I filled the dry sectors of the kajak in bash and nose with water, energetic chosen food, sleeping bag and a seating. Then everything was sealed with airtight lids carefully. The trip began at the Jala beach at 17, after greeting with family and friends. Sea was really calm, and the kajak progressed along with a slight lisp, leaving gradually Gjipea Bay, Dhermi and Palasa. There I stopped in Eco Camping - a pleasant environment oriented camp - to drink a cold beer, before departing towards the wild coast, away from any refrigerator. After completion of the Palasës sand, rocky shores Karaburun start, and soon you realize that you can not be brought to shore by preference. My Station Camp for the night, the Grama bay was several miles away and I could not stop sailing to arrive before night fell. Entry into Gram's with last rays of sunset was a magical experience, which was later emulated by the "blinding" light of the full moon, who hastened to appear on the monumental rocks engraved with inscriptions from sailors of all ages. My modest “ship” was laying in the white beach, and drowse beside it expressing a desire to every falling star, in "my hotel" with billions of stars. At Karaburun There was a deep sleep as restful and electrified by the radiation of the moon. At 6 am the alarm bell put me on my legs to hurry towards the north, to exploit every kilometer of the calm sea and the shadow of the mountain on the shore, before the crown of the sun appeared. Kajak overtaked, small pockets in a Fjord frame and latter the rocky shore after left the place to the widest bay of Karaburun, "Bristanit" where I expected to eat breakfast. Bunkers and military structures somewhat deterred me, so I changed plans and decided to progress a little further, to arrive at a gorgeous little bay, the Laurel’s. There seemed to sail into the liquid glass, and in such a place can not help enjoying the pleasure of Swimming in a truly virgin beach. As I was enjoying the breakfast, in a small cave on the shore, I began to plan the remained part of the cruise, because I really progressed a lot by taking advantage of the calm sea and the lack of wind. I decided to risk by heading toward Gjuza Cape though noon was approaching, carrying with it the establishment of wind and waves, while it is precisely this part of the coast that is characterized by high rocks, craggy and continuous for miles. Temperature grew, but the special hat that I was using to cover neck and long-sleeved shirts offer a very good defense. The only companions were flocks of sardines which sometimes danced in the form of plated rainbow kitsch in front of the kajak that tore deep dark waters, and seagulls dancing above us. While the wind did not delay to take place in "the noon meeting," faster than it you may think, and changing sea voyage becomes teasing - thankfully a few miles I could afford, so I proceeded persistently floating near the shore to be somehow sheltered from the wind. In the strait between Gjuza Cape and Sazan the waves were trying to overthrow the kayak, and the monumental entrance to the cave entrance of Haji Ali was a welcomed moment indeed. Dome of this pirate cave is impressive, as the waters get toned down her taking mystical nuances, fully worthy of a pirate cave. Rest not long after I felt an inner impulse to continue forward. After a bit I found myself again in the waters of the undulations to reach the eastern side where finally i was able to communicate with family and friends with mobile phone to assure them I was good - the part that resulted in longer than I had thought and even the fatigue had starting to make its own. I stopped in a very small beach with fine white sand in front and mountain Shashicës Vlora, where the handset want to leave you dry hermetic bags and gladly I comunicated by e-mail for achieving my desired : sailing Karaburun in kajak with full autonomy in ! I maked a little sunbath for several hours in the small beach, while the wind and the sea calmed, and the remaining forces began the last stage towards the beach of Vlora, known as "Zhironi". I arrived on the beach among tourists who are close the tents and were collecting items to prepare for dinner, completely indifferent to a red kajak landing . 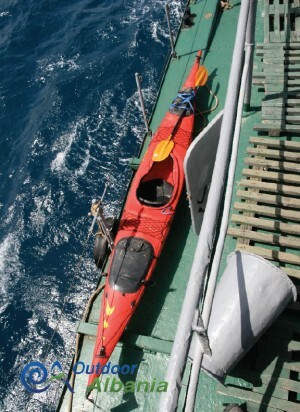 My adventure had lasted exactly 24 hours, during which sailed about 80 km - a personal record which was expecting to do and achieve in so short a time. Thanks Wolin king of the winds, Poseidon that almost did not use three-pronged fork and information on-line, my kayak odyssey ended successfully! Next time will revert with the crew ..